Designed and handmade in Portland, OR this hilarious and super fun slingshot is modeled after a 'Pickle Fork Slingshot'. A Pickle Fork Slingshot is a term used to describe most any slingshot that does not have tall forks that the slingshot band attaches to and shoots through. Due to this compact design when you shoot this slingshot your ammo will be shot up and over the top of the forks. Please follow the link below for a detailed explanation of how to safely and properly shoot a slingshot like the Nut Shot! The frame of the slingshot is Grade 5 Titanium. The dimension fits into your palm and back pocket nicely. It packs away just about anywhere. This is the one of the smallest yet still completely functional slingshot made by OOAK Forge. Works well with a pinch grip. 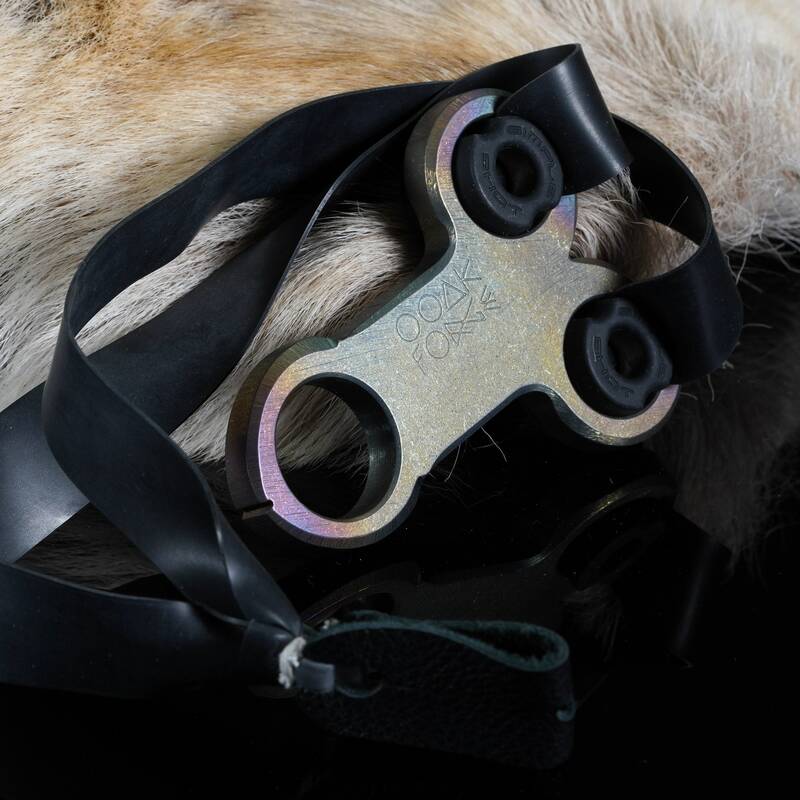 This slingshot stands above the average slingshot that you may be used to seeing. This slingshot will not rot or break. Here is a link to our Instructable on how to make your own bands from rubber bands. WE WILL NOT SHIP BALL BEARINGS (AMMO) OUTSIDE THE UNITED STATES!!!! If you choose to purchase the Magnet Lanyard and you live outside the United States we will only ship the rare earth magnet and the paracord. OOAK Forge takes no responsibility for orders shipped outside of the United States once they have left our hands. International orders are subject to F.O.B. Origin, the purchaser assumes liability once the carrier has picked up the items. All slingshots shipped outside the United States will not include ball bearing ammo.